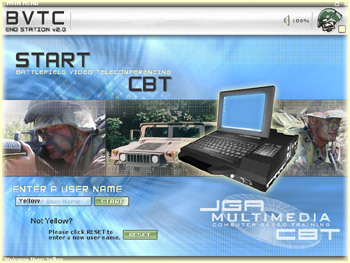 JGA CBT - JGA, Inc.
JGA prides itself on its modern and innovative approach to Computer-Based Training (CBT), combining a proven complement of Army System operational and technical expertise, artistic ingenuity, and state of the art training techniques and technologies. Our development team is highly skilled in technology-based training. The JGA training development approach is based on the Army System Approach to Training (ASAT) methodology, Instructional Systems Design (ISD) / Systems Approach to Training (SAT), and the DoD-wide initiative Advanced Distributed Learning (ADL). ADL was established to use learning and information technologies to modernize education and training strategies of the military, through the development of a common technical framework for computer and Web-based learning. The JGA Team adheres to these principles in its development process, but takes this concept one step further. By focusing not only on the methodology behind the development of object-oriented instructional components, but also on the content and distribution method itself, we are able to significantly reduce the time of instruction while increasing the overall effectiveness of the training. The ultimate goal is to provide a tool that effectively enhances the knowledge and performance of the target audience. Samples of JGA Multimedia CBTs are available online! Click on the screen to begin! The CBT Assistant is an animated character that interacts with the trainee throughout the CBT, offering suggestions, encouragement, and entertainment. The CBT Assistant’s personality is customized to be compatible with the target audience demographic. JGA can customize the CBT Assistant for both the Armed Forces and Industry.